Is anyone else out there in pure disbelief that it is already April? Time is just flying by, I swear. Close To My Heart's April Stamp of the Month is called "My Sunshine" and has some fun images for Spring and Summer cards and layouts. 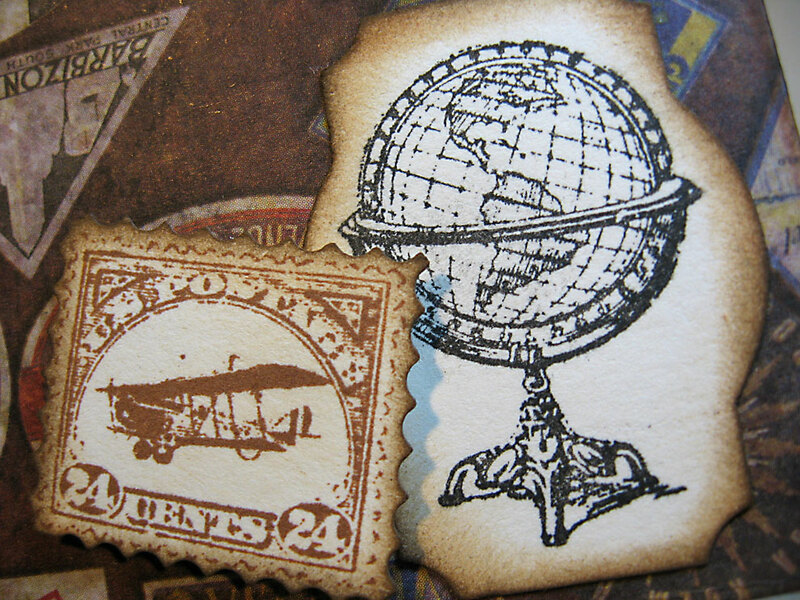 You can view all eight images in this great stamp set in the right-hand column of my blog. And you can get this set for only $5 with any $50 purchase from your CTMH consultant. 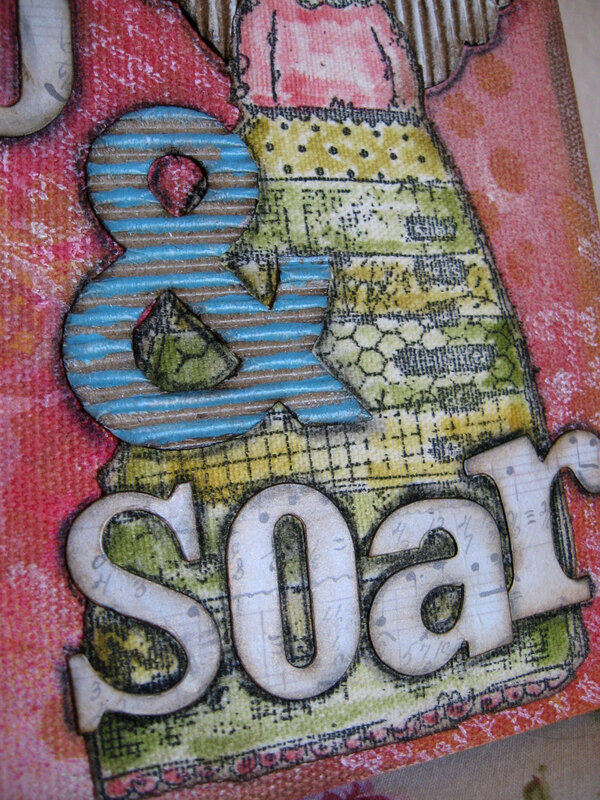 Now for the Stamp of the Month Blog Hop. With 61 consultants participating in the hop, you're sure to get some great inspiration this month. If you are already hopping, you came here from Kathleen Androlewicz's blog. To see where to go to next, keep scrolling to the end of my post and I'll take you there. And if you happen to get lost or stuck along the way, you can always go here to view the entire list of Blog Hoppers. 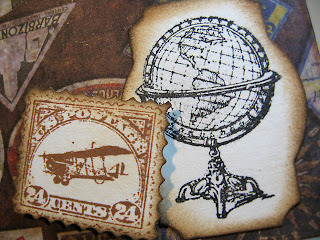 Several of the stamp images coordinate with cuts on the Cricut Artiste cartridge which makes things so easy for card making! The three images I used are an example of that. 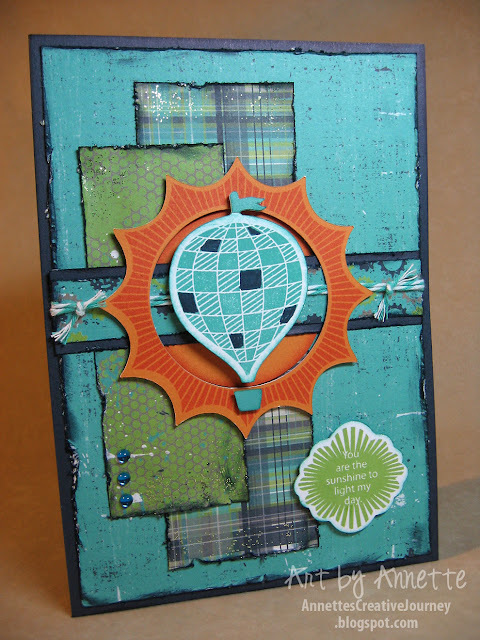 The hot-air balloon, the starburst, and the sentiment all match cuts from Artiste. I love that! I used the new "Later Sk8r" papers and some blue epoxy bubbles. 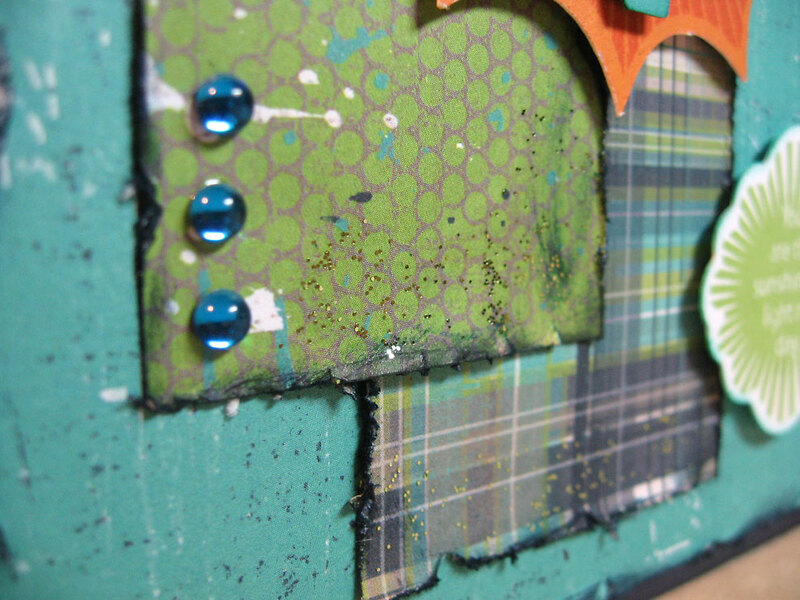 My edge distressing tool got a lot of work on this card too. After raking up the edges of all my papers, I inked them with Outdoor Denim. I love all the blues and greens in this paper pack, but I felt my card needed a contrasting color. In this case, Sunset. This bright orange is a perfect accent that really pops. Here's a tip if you don't already do this: print a color wheel from the internet and keep it handy when making cards and layouts. 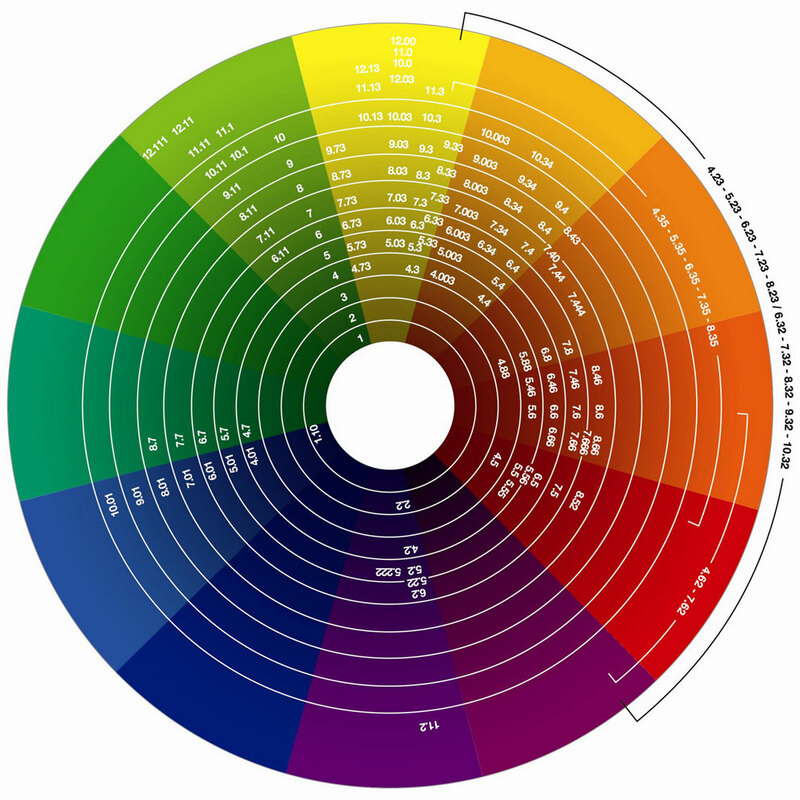 I look at the wheel, see the colors I have to work with, then look across the wheel to the opposing colors and pull one or two of those into my design. See how orange is across from blue and green? Now on with the hop. Let's see what Laurie Newton has come up with. 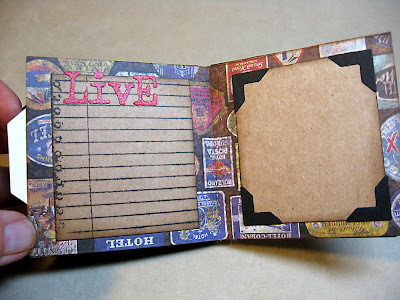 Enjoy the blog hop and then contact your CTMH consultant to get yours today! The challenge this week over at the Simon Says Stamp & Show blog is to use a favorite quote or saying in your art. There are already SO many submissions over there, you've just got to check them out. So inspiring! For mine, I didn't have time to create something new but instantly knew what quote I wanted to use. It's a Tim Holtz/Stamper's Anonymous stamp that I've always loved. I had worked it into a patchwork canvas I made last year, and thought it would be great to bring it back again for this challenge. 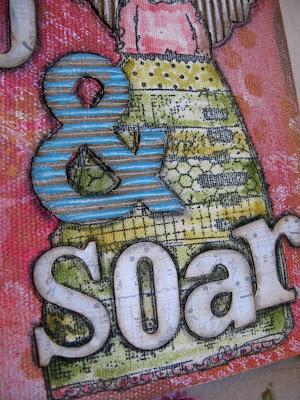 Inspired by the patchwork projects I've seen by Tim, I created this using many of his techniques and products. See the quote in the center? 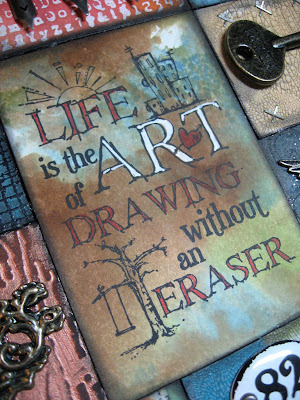 "Life is the Art of Drawing Without and Eraser." I just love that line because it's so clever and true. I also love the little images worked in with the words. In life we make choices. Sometimes not the right choices. But we learn and move on. We can't erase them. They're what make us who we are. 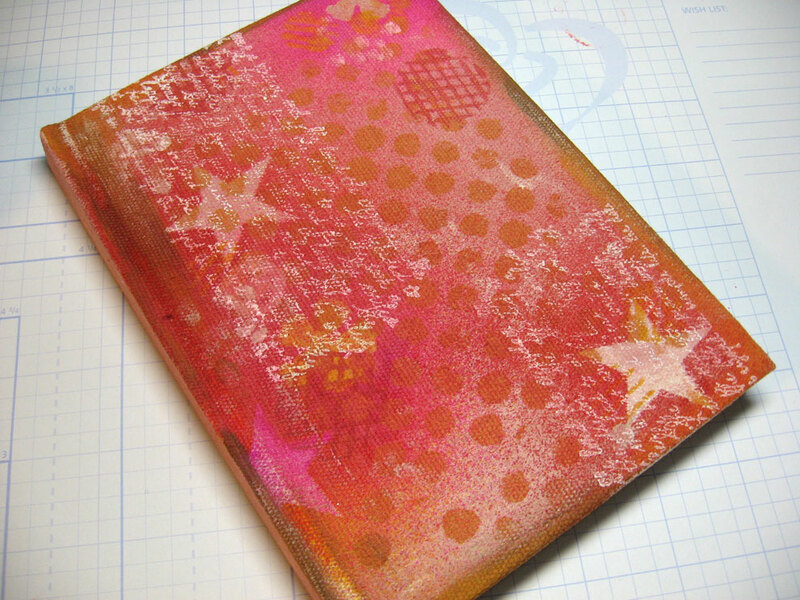 I think to myself that if I had to choose only one stamp to keep and get rid of the rest, this would probably be the one. If you'd like to see more close-ups and read more details about this project, please go to my post from last year. Thanks for stopping by today. Have a wonderful Easter weekend! 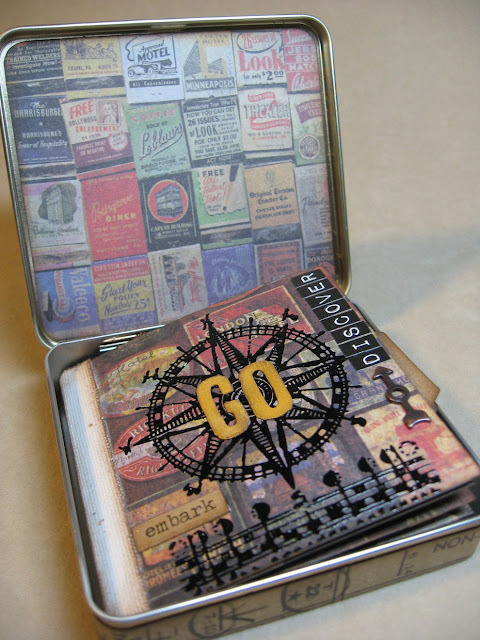 Recently my friend Lisa Russell gave me a bunch of small cigar tins she plucked from her neighbor's recycle bin. Hey, I don't blame her. She was walking the dog and there they were, a lot of them, right in the open bin. Why not? I pulled them out and stared at them, thinking of what I could do with such a small tin. Then I remembered a mini book Tim Holtz created and shared this video on how to make it. It was the perfect size to put in my tin! Keep in mind, Tim has done TONS of videos and they are all categorized right on his blog. You can watch them right there or go over to YouTube. Up to you. It's about 3 1/4" x 3 1/2". 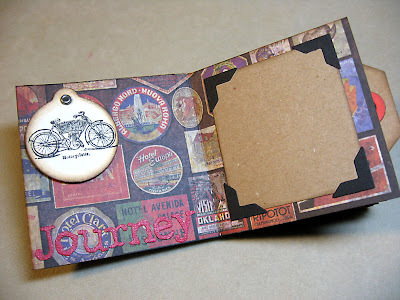 I decided it would be a travel mini book inside. But the theme could easily be adapted to something else. I think it would make a great Father's Day gift. 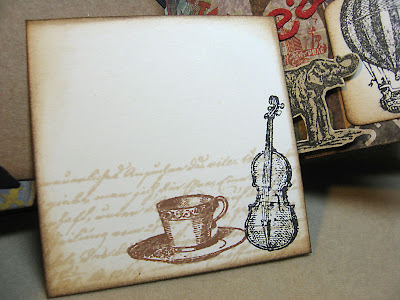 All supplies used are listed below, and most everything you will find at eclectic Paperie, so just click on those linky photos at the bottom and they will take you right to the store. The Destinations paper pack was my choice for this project. 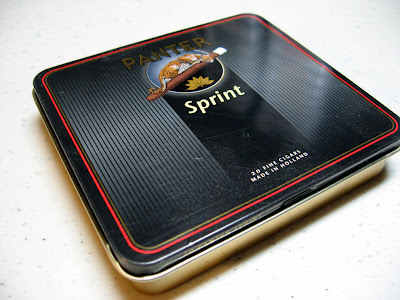 A 1/2" x 12" strip from one of the sheets is adhered around the sides of the tin. I had to patch in another small piece on the back for it to reach all the way around. 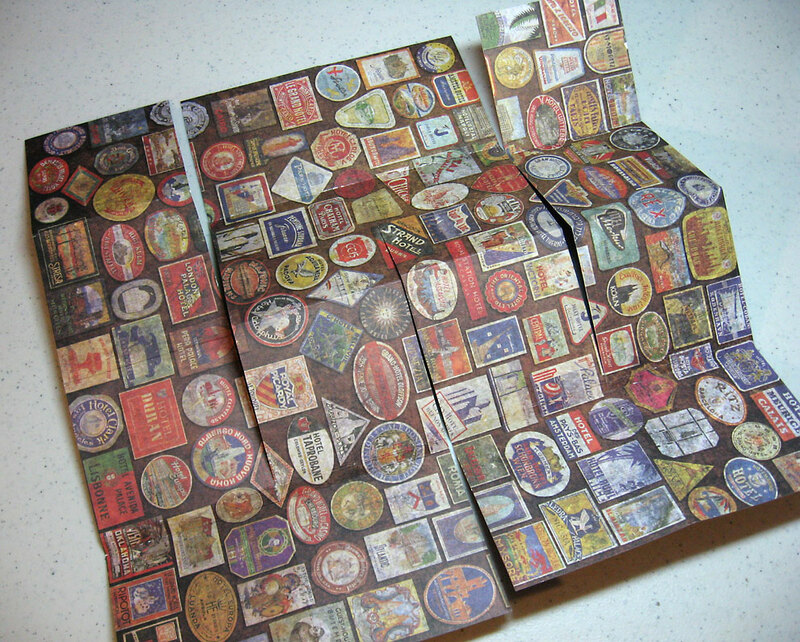 Just so you can see what's going on under the collage of items, this is what adhered to the lid first. I used Kraft-Core card stock, embossed the teal one with the new Airmail & Compass Texture Fade, sanded it and inked it with Walnut Stain. 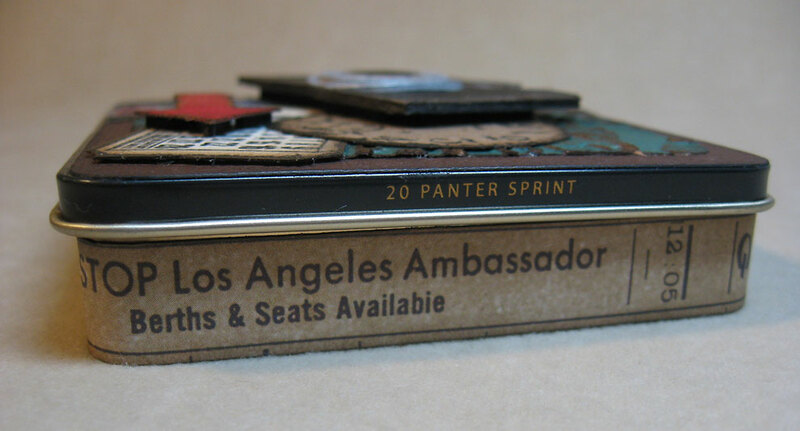 The filmstrip is also new (Mini Filmstrip and Tickets die) cut from black card stock, layered underneath with matchbook images from Destinations. The camera is from the Vintage Alarm Clock and Camera set of Movers & Shapers dies. Love this little guy. I cut him twice. 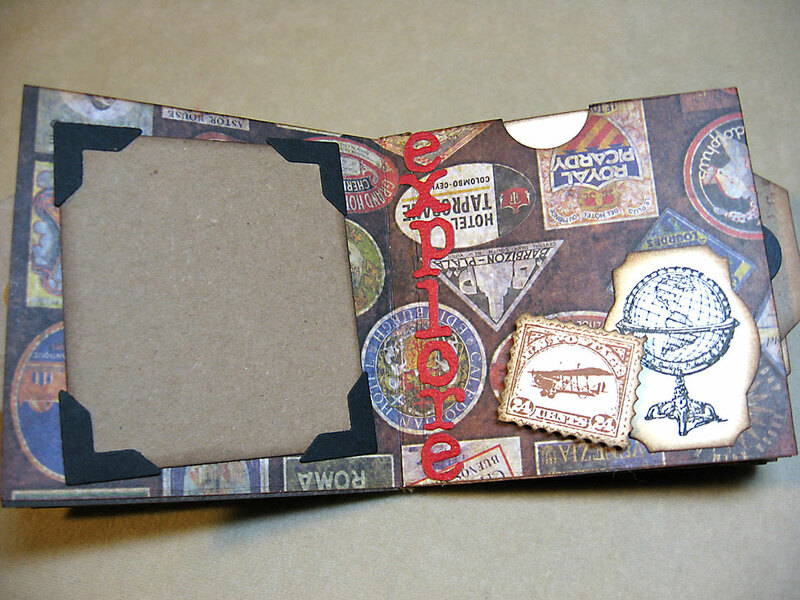 Once from grungeboard and the second from black card stock. I used Brushed Pewter Distress Stain to make the shiny pieces. Yep, some of those are pretty tiny. 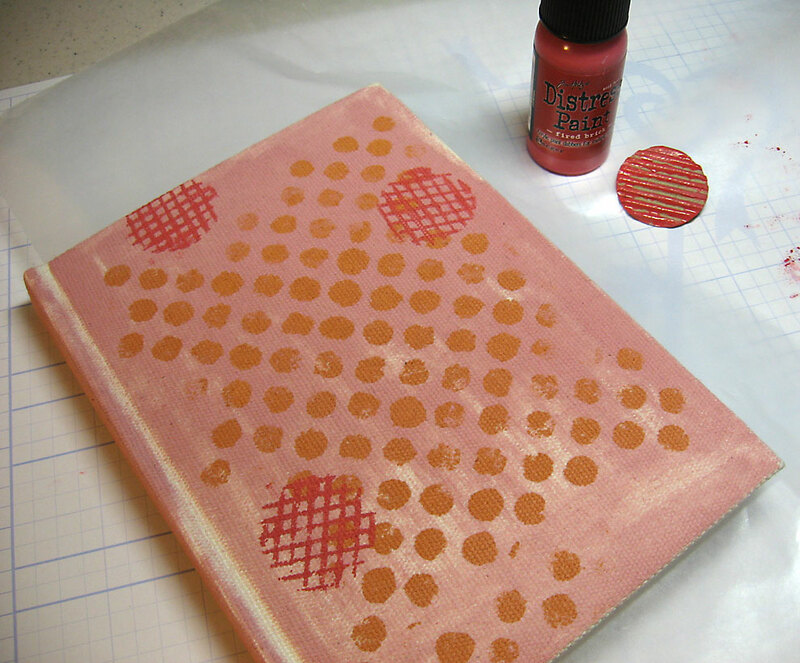 After they were dry, I glued the black piece over the grunge piece, then popped those tiny accents back into place. 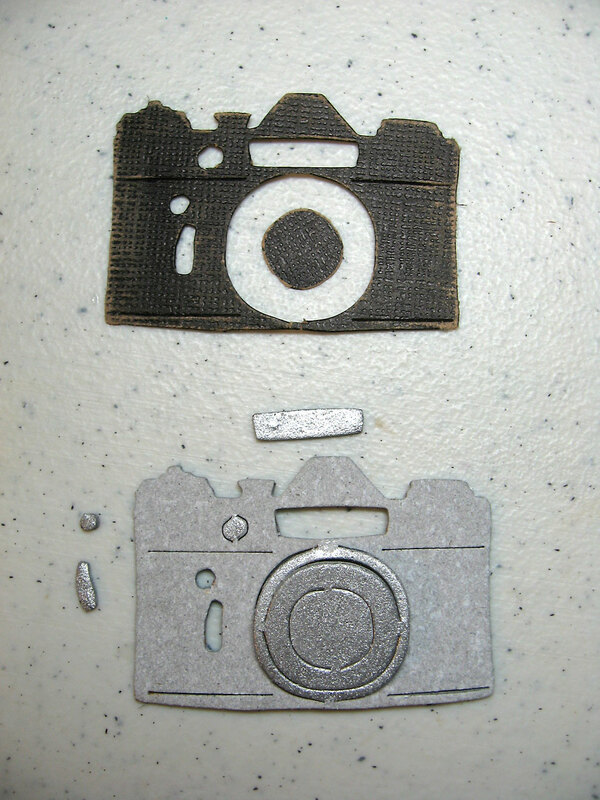 Since I popped up my camera on the cover of the tin, I had to create a card stock base under the camera for those small pieces to stick to when I put them back into place. Make sense? Here's a before and after. I stamped a clock and ticket and die cut an arrow and layered them either with glue stick or foam tape for dimension. Now for the mini album inside. 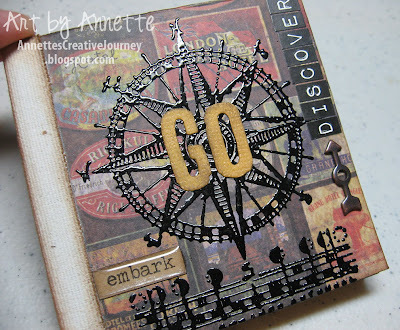 This is so fun and easy to make. It's only one sheet of 12 x 12 paper! Tim does a wonderful job showing how to cut the paper and assemble the album, so instead of reinventing the wheel here, I ask that you simply watch his video at the link I gave you above. One thing I did learn on my own is that if your paper has a distinct direction of the print like mine (not random) that when you make those first cuts, be sure to turn your paper a quarter turn to the right. This will make most of the images on the pages upright in the finished folded book. There are still a few pages where the images are upside down, but it didn't bother me. 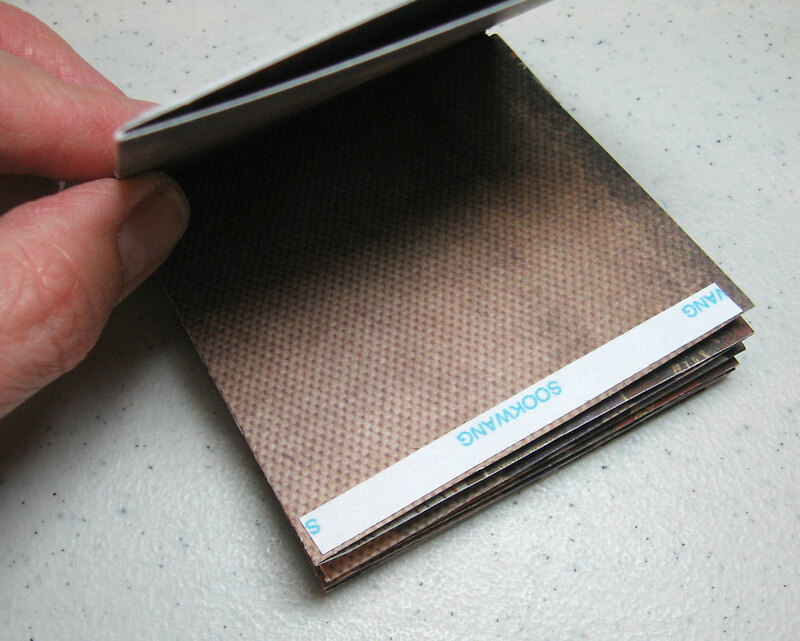 For example, when the book is first folded down, Tim used tissue tape to bind the spine and all the pages. 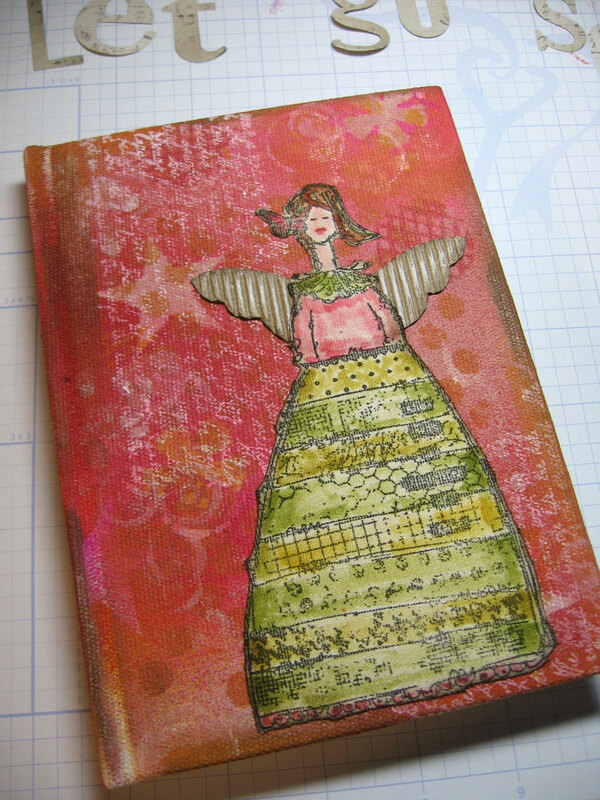 I skipped the tissue tape, in fear that it wouldn't hold well enough, and also wanted more space for my photos and stamped images. 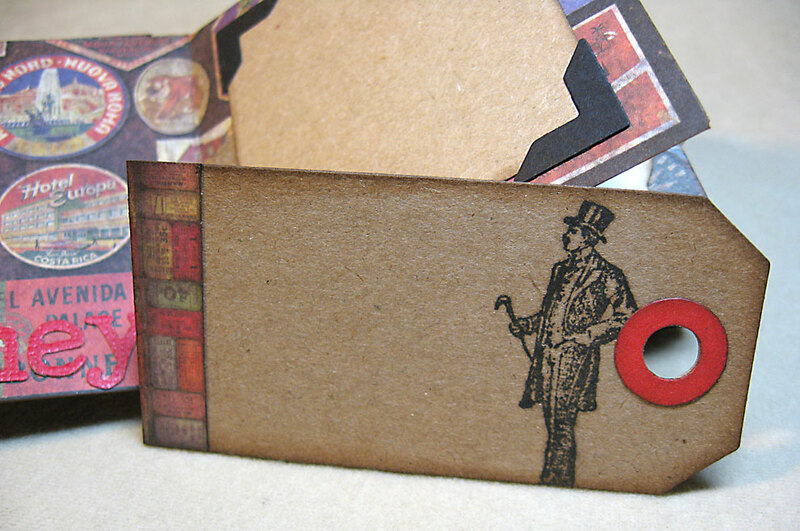 Additionally, I altered the pocket location on the pages so that some are open at the top and some on the sides. Tim's are all on the sides, as you'll see in his video. 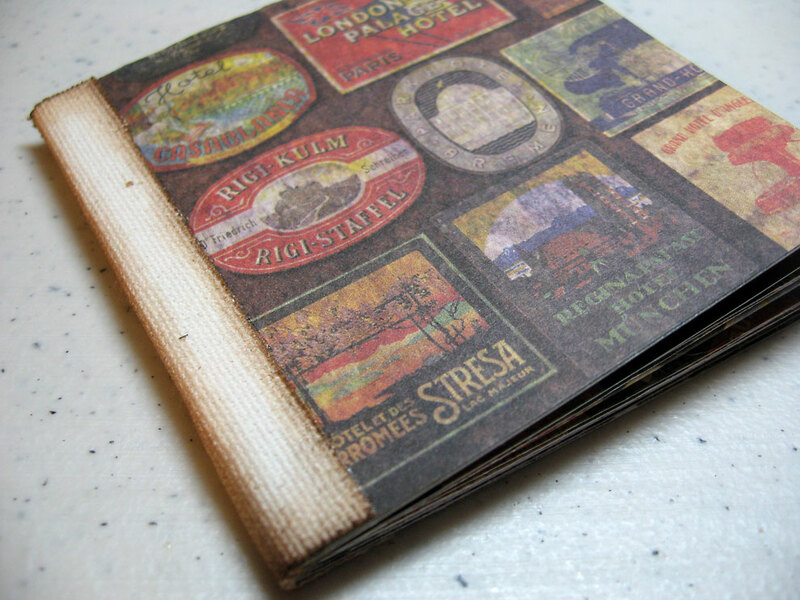 To make my alternating pockets, I used 1/4" ScorTape to seal the pages as needed. I did this before putting on my spine simply for easy access. I opted to use Sticky-Back Canvas for my spine. 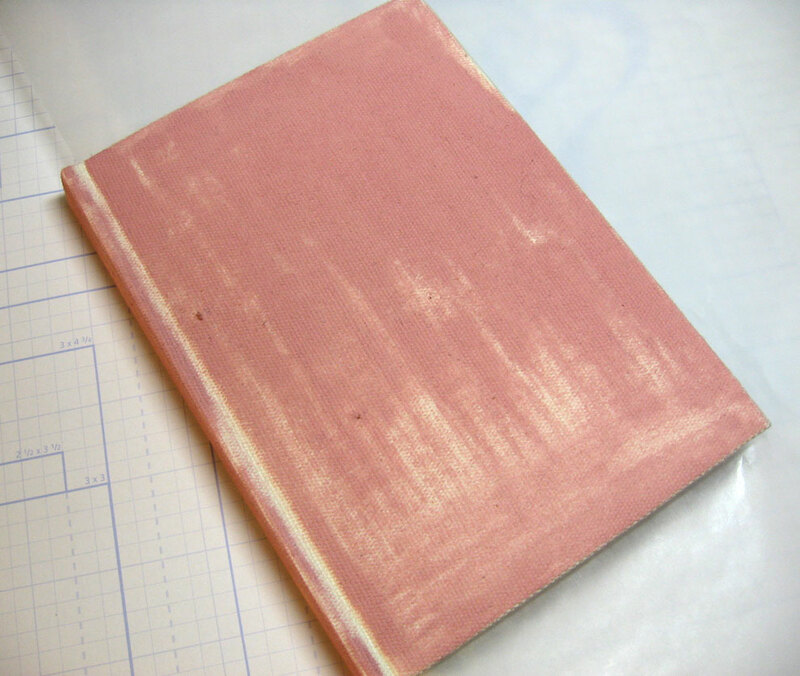 I cut a piece 1" x 3" and first adhered half to the front cover, then for added strength I squeezed a thin layer of Super Thick Tacky Glue onto the canvas where the pages would touch, then wrapped the remainder of the canvas to the back cover. 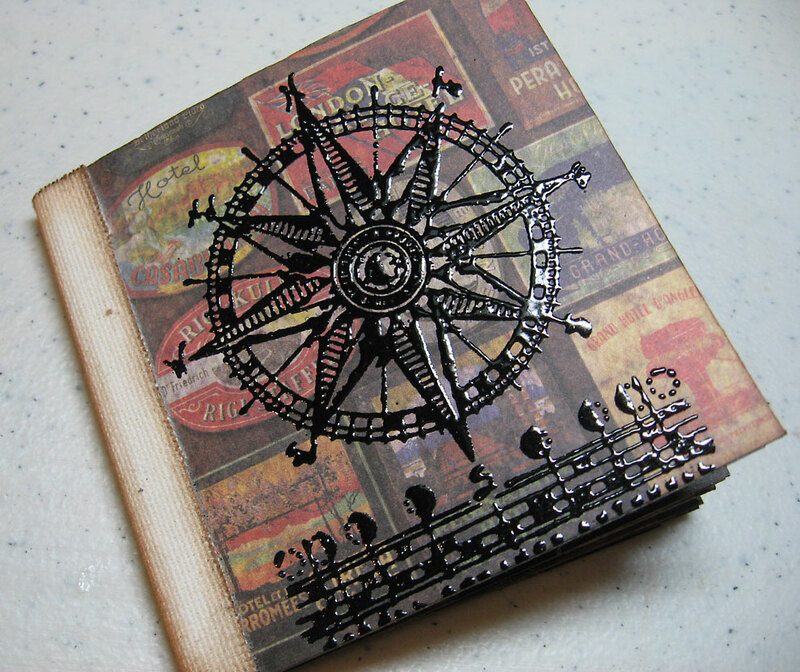 Carefully, after laying the cover flat on the table, I stamped and embossed this compass image with black powder then heated it. The inside pages each have a photo mat and stamping and a travel-type word. Journey is the first. The small Motorcyclette image is from one of Tim's newest sets called "Tiny Things" and I knew when I first saw it, I had to have it. 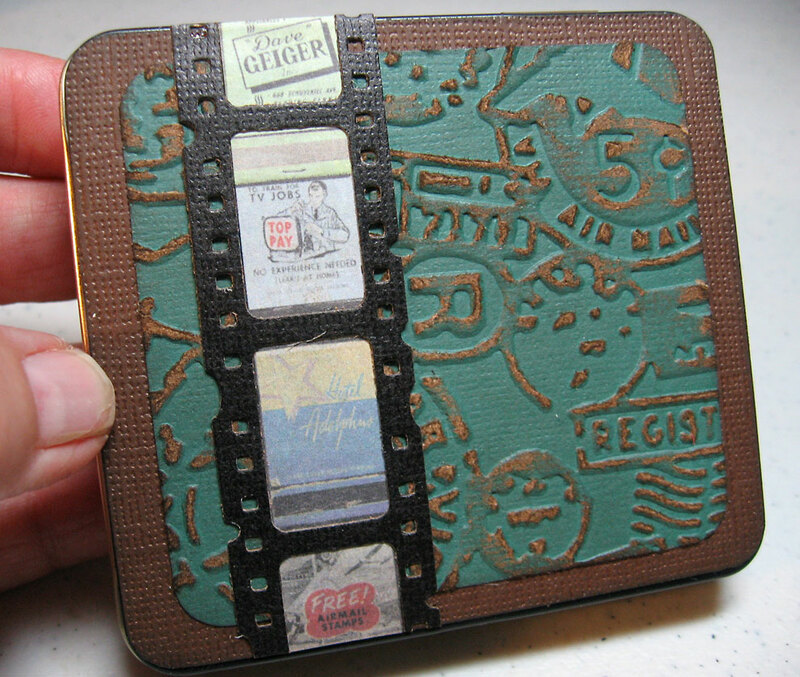 It has 25 quirky little images. I used a lot of them in this mini book. See the pocket on the right with the tag peeking out? 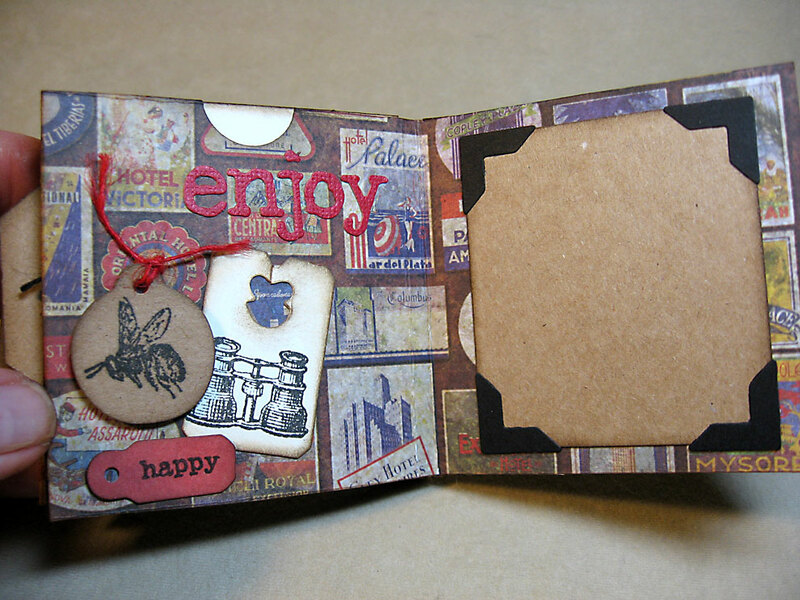 This tag from the Tiny Tabs and Tag die is the perfect size for this mini book. It sticks out just a little bit, so it's easy to pull out and still fits in my tin nicely. This would be a good place to journal or write a nice message. Next page. Explore. 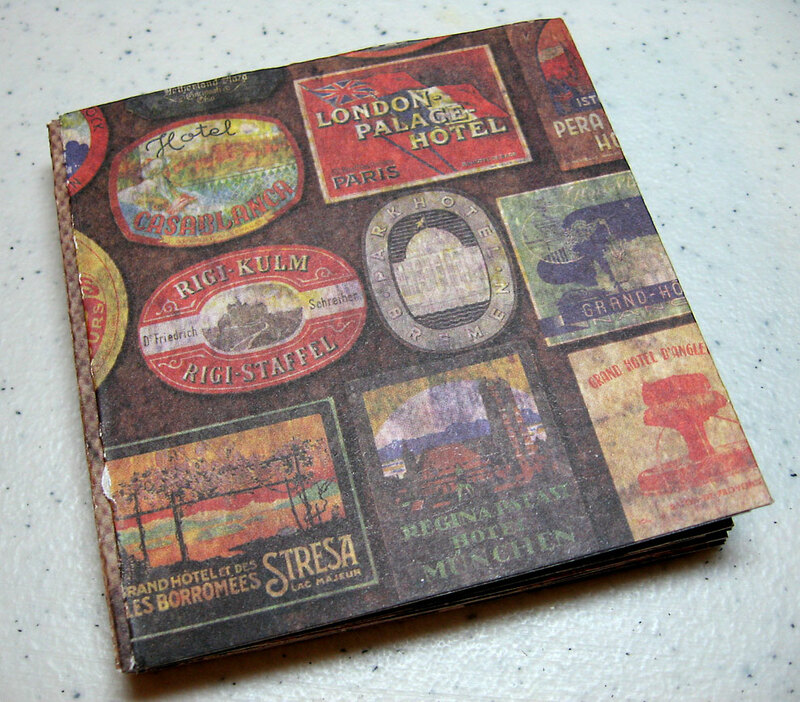 The pocket is at the top this time and since a tag doesn't allow my book to fit in my tin here, I made a simple square piece to slide inside, then created a pull-notch with a 3/4" circle punch. 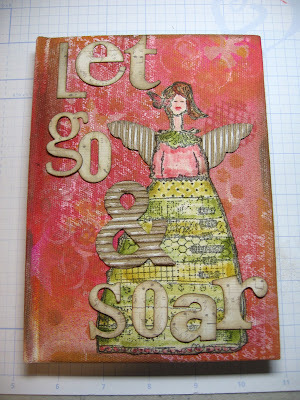 A few stamped images and inking around the edges. Easy. Next page. 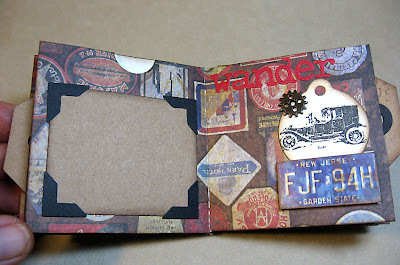 Wander. See the New Jersey license plate sticker? 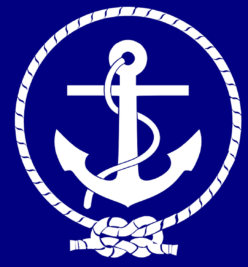 That means something special to me since I'll be going to Ranger University in New Jersey at the end of April. (!!!!) The pocket is on the right side again with a tag peeking out. I stuck with Archival inks for all my stamping because I knew I would be journaling with a marker-style pen later and don't want anything to bleed. Next page. Dream. 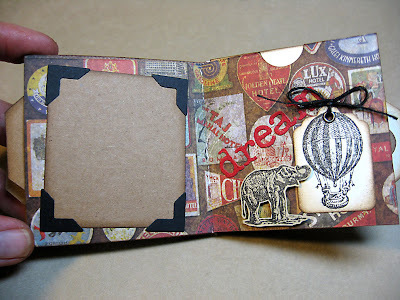 What better to have stamped on this page than an elephant and a hot-air balloon. Two things I've never ridden, but dream to some day. The pocket is at the top again. See how I'm alternating? Tea cup and violin plus some script in the background. Random, but fun to look at. Next page. Enjoy. Love the binoculars and the bee. They make me happy, as you can see. What better things to look at through your binoculars than birds and bees? I love these sweet birds on a branch. Final page. Live. A good word to end with. No pocket here because the right-hand page is also the back cover. And it fits perfectly in my tin. Now it's your turn. 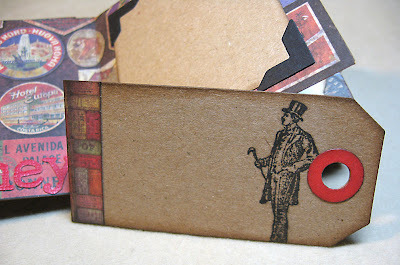 Grab a sheet of your favorite 12 x 12 paper and watch Tim's video and make one of these fun little books today. It takes no time at all and you'll have a great time doing it. Thanks for stopping by today. Have a creatively fantastic day! Ranger University & Give-Away Winner! Guess who's going back to school? More like a weekend of unbelievably creative inspiration, hands-on instruction and FUN! 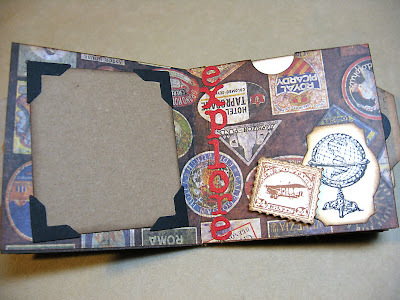 Yep, I got a wonderful e-mail of acceptance from non-other than Tim Holtz himself yesterday afternoon saying I had been accepted. So what is Ranger University? Held at Ranger Industries in New Jersey, it's a weekend program designed to educate designers, shop owners, bloggers and instructors on the extensive Ranger product lines so we may pass along our knowledge and promote these products with confidence to YOU. Tim Holtz, Ranger's Creative Director, will teach hands-on techniques with Perfect pearls, Melt Art, Inks, and Paints and Embossing Powders. 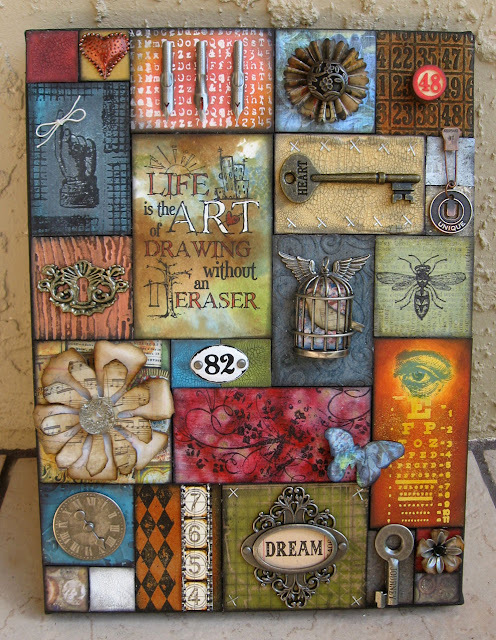 Claudine Hellmuth, mixed-media collage artist and licensed designer, will provide creative insight and teach the versatility of her signature Studio line. 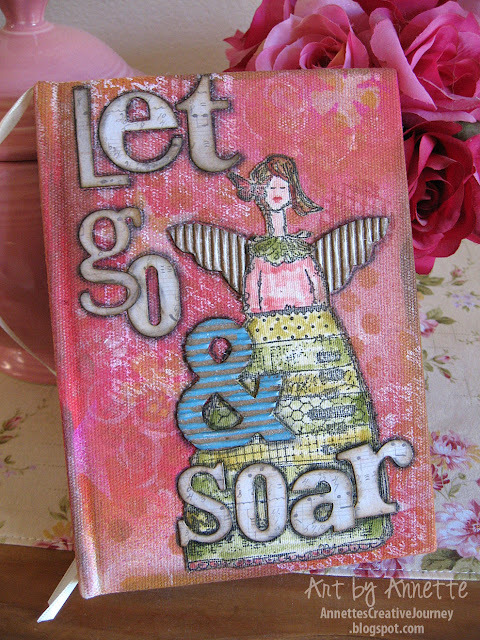 Dyan Reaveley, Ranger Senior Educator, will introduce her signature Dylusions line of products with a spin on art journaling. and Mackie Mullane, Designer and Educator for Vintaj Natural Brass Company, will show how to achieve a variety of beautiful effects on metal using Vintaj Patinas, Glaze, Embossing Powders and UTEE. Needless to say, I'm extremely excited and honored to be attending this year. The event is scheduled for April 26 - 28. My hotel reservations are set and I'm booking my flight today! Will keep my fingers firmly crossed for you, Annette! Congrats Alison! Now I'll just need you to e-mail me at AnnetteGreen@me.com and send your mailing address so I can send you box of goodies! Thanks all. Have a wonderful day. 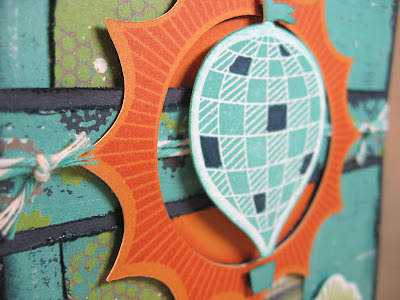 It's another eTeam Picks Challenge over at eclectic Paperie, and this week's is to use corrugated cardboard in your project. 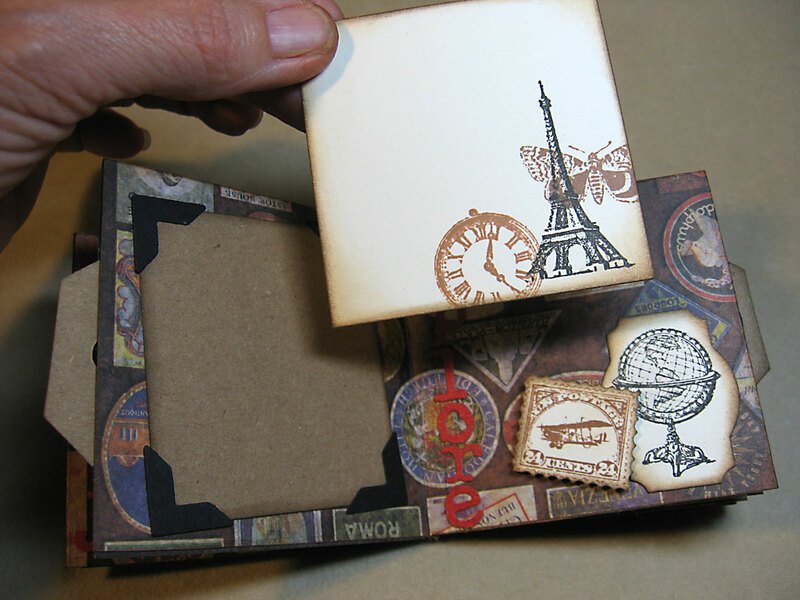 Be sure to check out Bonnie Irvine's trio of mini houses she created here, they are so whimsical and fun. 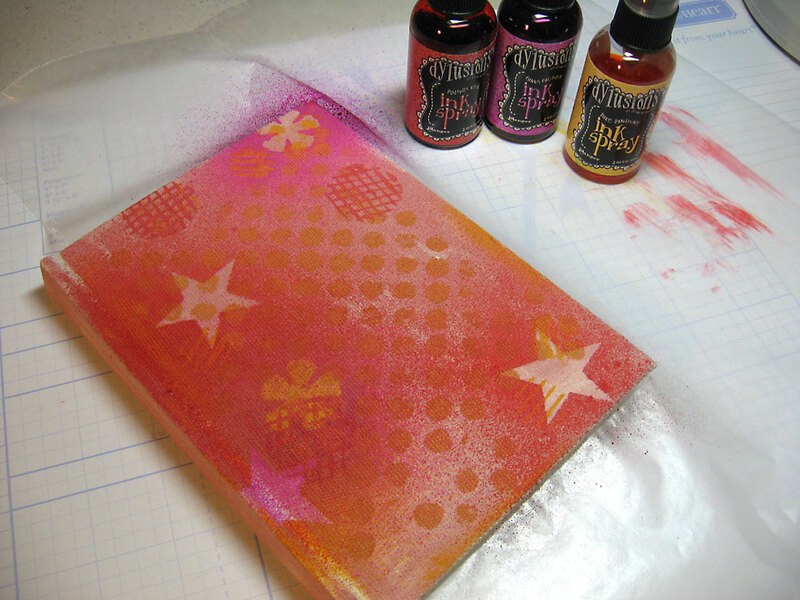 That will get your creative juices flowing so you can join in on the challenge yourself. You'll have a few weeks, so plenty of time. 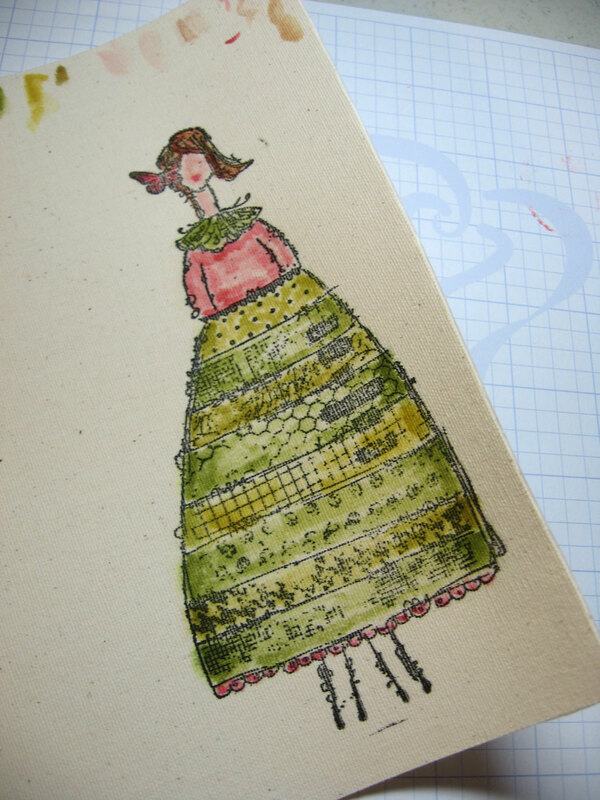 See all the details at the end of my post if you're interested. 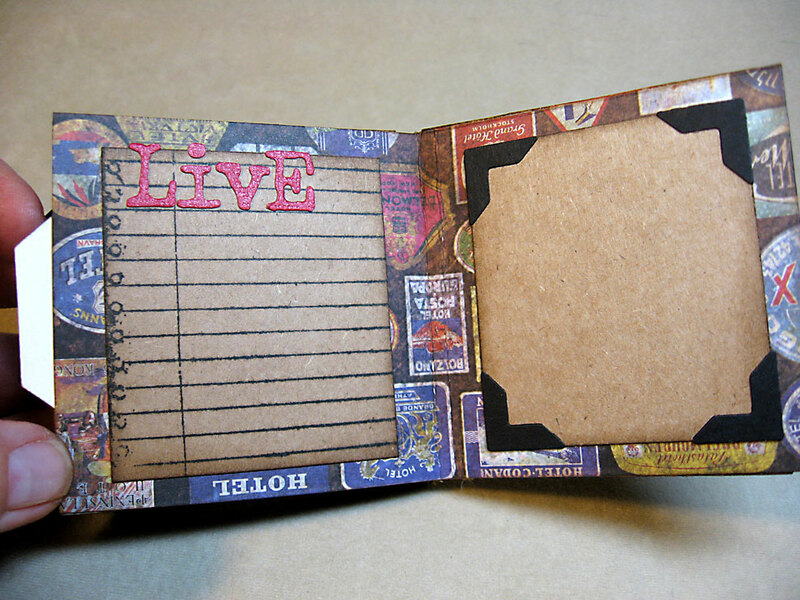 The journal is just a bit larger than 5 x 7 inches. 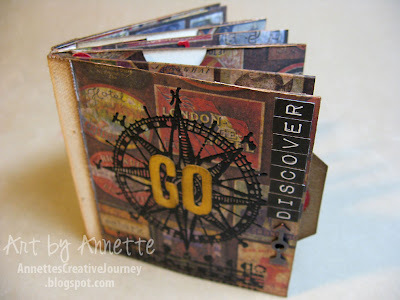 A perfect little book to carry along a creative journey. It started with this Canvas Journal from Close To My Heart. (links below) The intro and ending pages are blank and the remaining 80 pages are lined with pale gray rules. 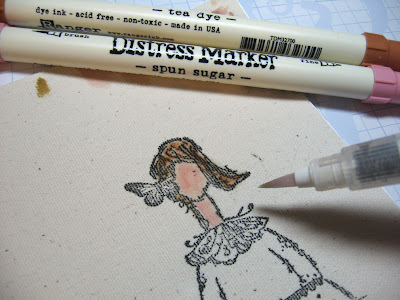 I grabbed all my Distress Paints and started with a wash of Victorian Velvet. Notice it's not an even coat and also that I put a sheet of wax paper under the cover to keep the pages clean while I worked. 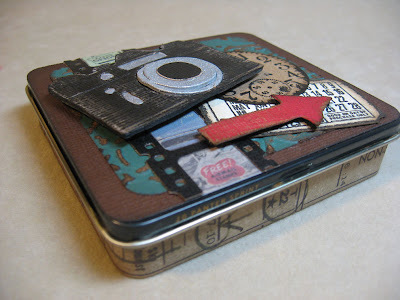 Next is Rusty Hinge dabbed through a stencil (Wendy Vecchi, Studio 490). I had some corrugated shapes in my stash and found a circle, painted it with Fired Brick and stamped it here and there. Just playing around at this point. Not sure where this is going. 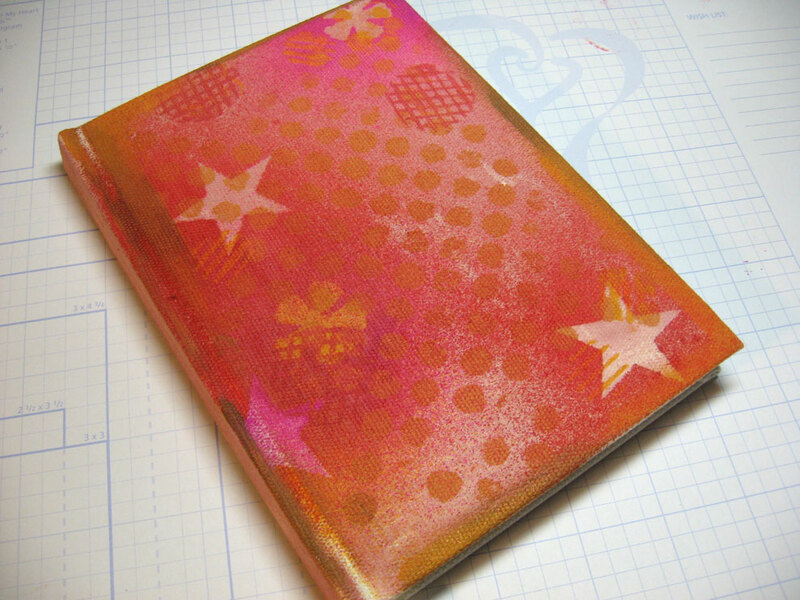 I laid a few more shapes down and shot the cover with a few colors of Dylusions sprays. Wow! Love those bright colors. 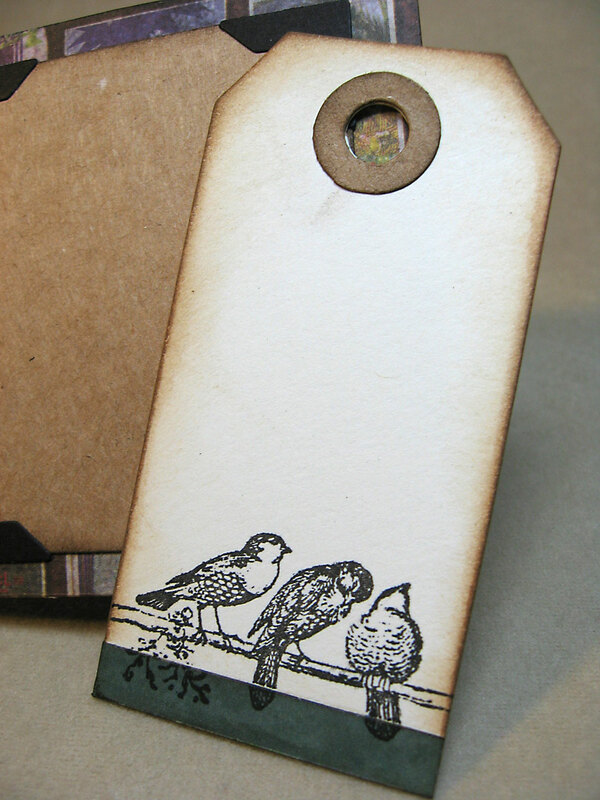 But I felt they needed a bit of toning down, so I rubbed some Vintage Photo and Walnut Stain Distress Paint here and there with my finger, and added a bit of Wild Honey too. "She was a vintage soul. She loved the everyday. She loved. She had the faith to dream..."
and on it goes. I just love that. Next I stamped this girl with Archival Black ink onto Sticky Back Canvas, natural. The stamp is called "She was a Daughter" and it's large! From head to toe, she's almost 7 inches high. I cut off her feet for my book. Here I colored her with a water brush after dipping it into Distress Marker colors which were scribbled on my non-stick craft sheet. 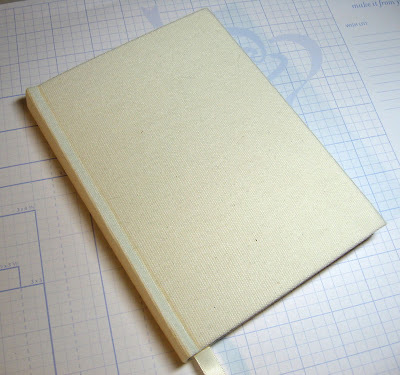 There she is ready to be cut out and adhered to the journal cover. But first, I think she needs some wings. So I cut this shape from some cardboard, painted it white and edged it with Walnut Stain Distress Ink. Yep. That's what she needed. 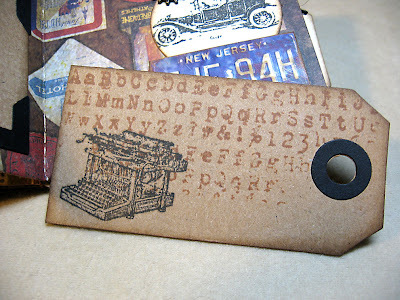 I just got this fantastic Tim Holtz Word Play die and was thrilled to finally use it. 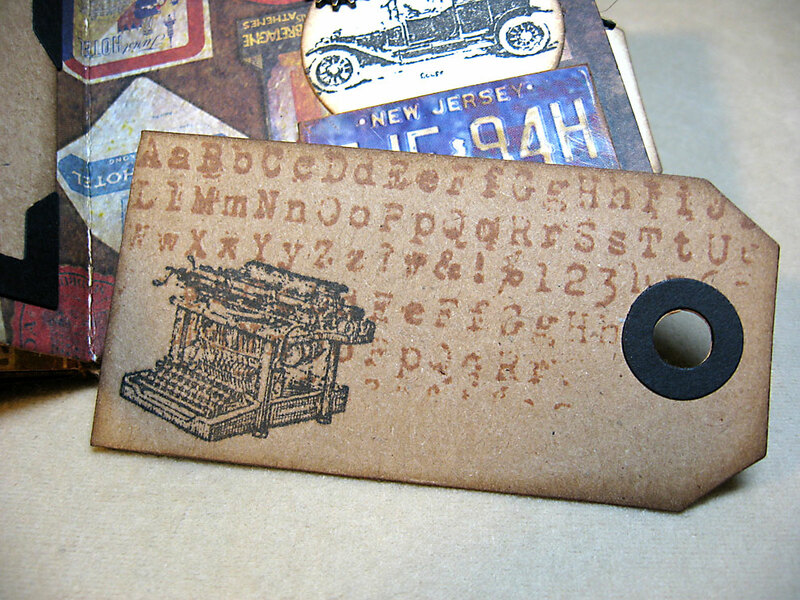 I cut these letters out of Tim's new paper pack French Industrial and inked the edges with Walnut Stain. 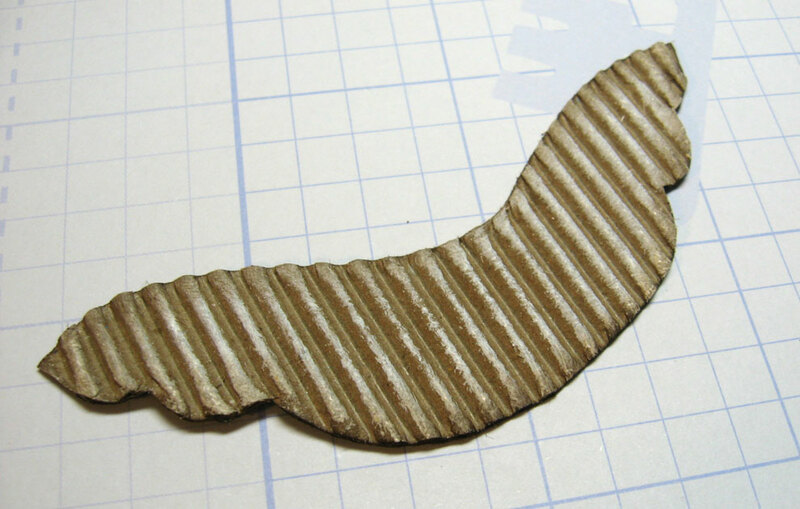 The "&" symbol is a corrugated piece from my stash I mentioned earlier. 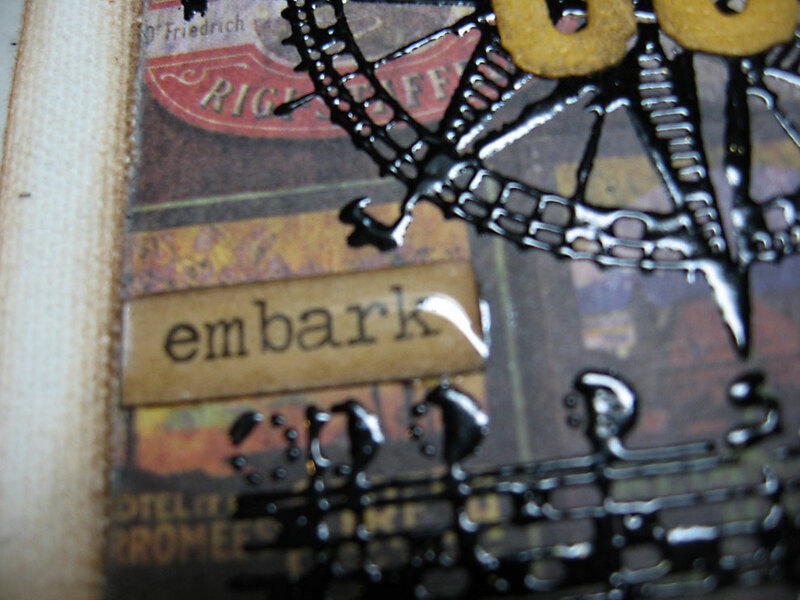 I used it rather than the Word Play one because of its size and relationship to the rest of the elements. Here I am just placing the letters to get an idea of how I want to arrange them. 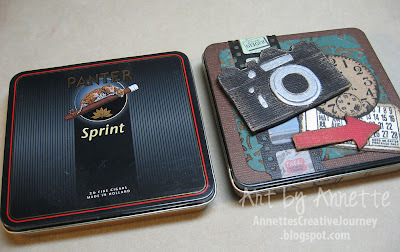 I painted the "&" symbol with Broken China Distress Paint and then adhered all the letters to the cover with multi-medium. After it dried, I went around the girl and the letters with a charcoal pencil and smudged it with a cotton swab. Let's not forget the back cover. 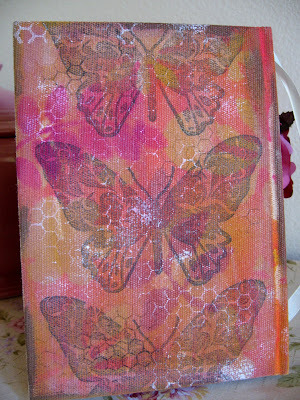 I used various stencils and colors, then stamped the big butterfly three times with archival black. 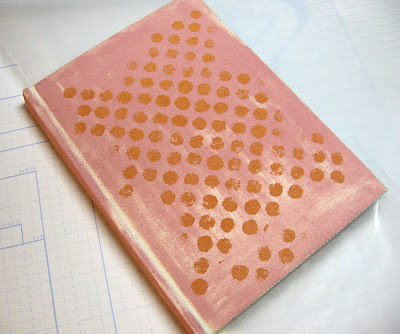 I finished it off with some white paint stamping and then a coat of sealer to the whole journal. Here's another look at the finished cover. I hope I've inspired you to use corrugated chipboard on a project of your own. 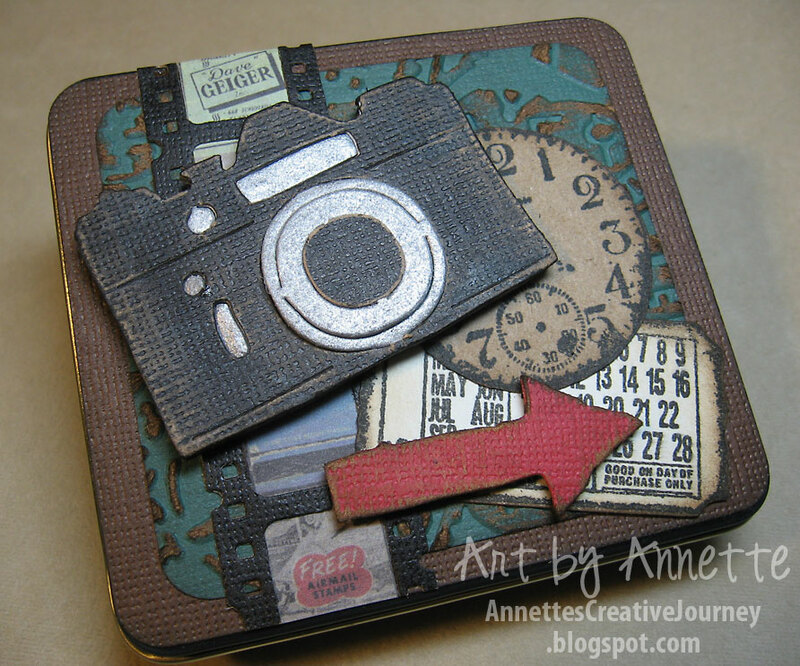 Share a direct link to your creation, not just your blog, using the Linky Tools feature at the end of Bonnie's post. If, for any reason, the Linky Tools doesn’t cooperate, please add a link in the Comments section of the blog. 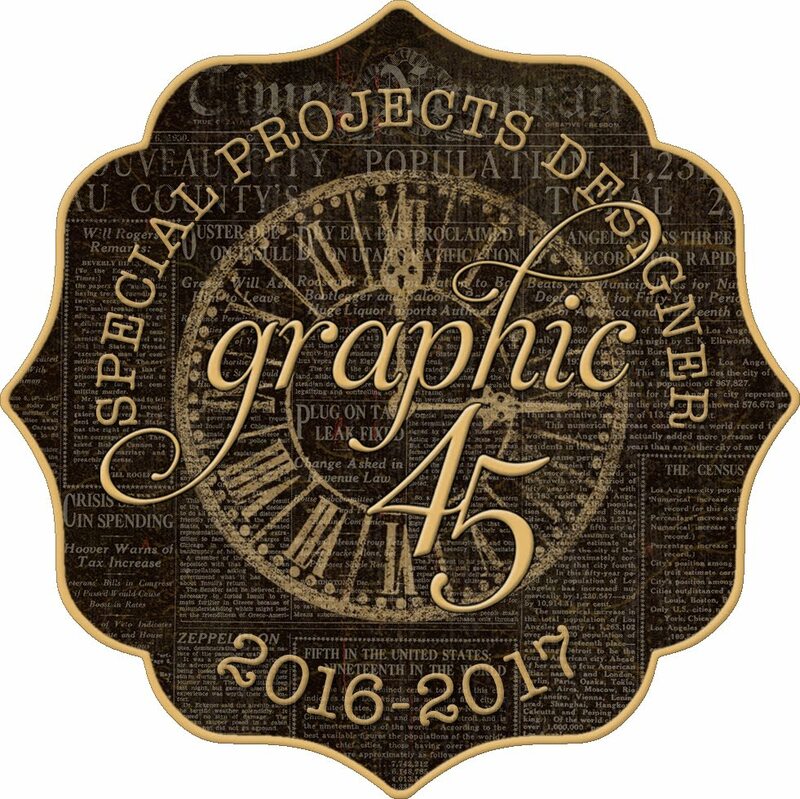 If you’d like to be considered as one of our featured projects and be entered into our prize drawing, please be sure to add your link no later than 6pm EST on Thursday, April 5.